THE first completed Class 345 Crossrail ‘Elizabeth Line’ EMU has been moved to the Rail Innovation and Development Centre (RIDC) at Old Dalby, Melton Mowbray, for further testing. 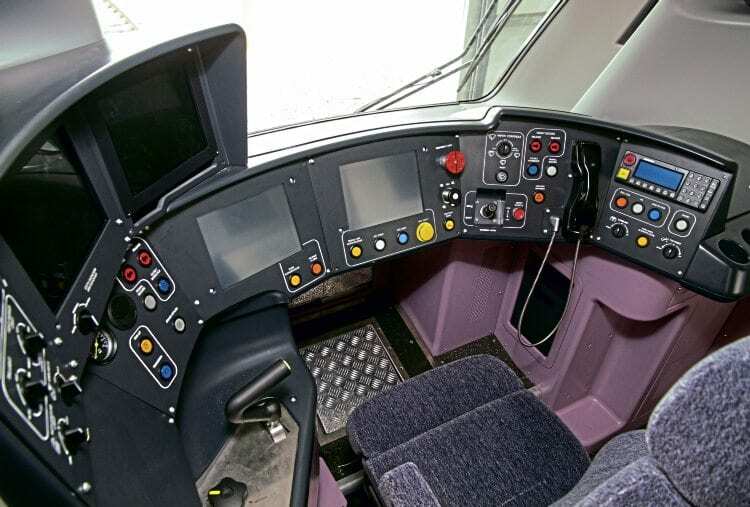 The driving cab of the Crossrail trains. It is the first train for the UK on Bombardier’s ‘Aventra’ platform. On July 29, The RM was given its first preview of the new train – unnumbered set No. 345001 – at Bombardier’s testing and commissioning facility at Derby. The unit made several runs on the short test track in its lilac & white livery. There is an absence of a yellow front end too, rules being relaxed earlier in the year as the train headlights are considered sufficient warning.